We have settled into the town of Verbania, on the shore of Lake Maggiore in northern Italy, and I think we will stay here for a few days. I’ve been driving too much, primarily because there are so many incredible places to see. 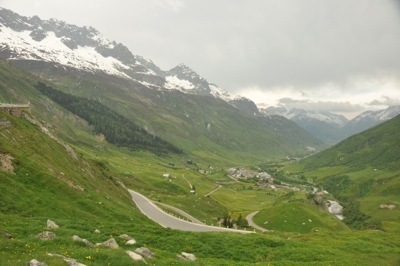 It’s just too tempting to get in the car and drive over the Swiss Alps, as we did yesterday, but I have to remind myself that driving in that part of the country is not speedy, especially when you choose the scenic route over the Furkapass and the Solonpass. We spent most of the day in the car (after having driving half the day on Tuesday and three hours on Monday) so I’ve requested a three-day rest here. We’ll still do some daytrips. Even though it was cloudy in the morning, from the moment we left Luzern the drive was spectacular. Eleanor kept trying to get shots from the car, which rarely turn out well (it didn’t help that our windshield was rather bug-splattered), so we stopped frequently. The Alps loom over everything with their sharp snowy peaks and down below flat-bottomed valleys are green with farms and dotted with small villages. You probably know this, but the Swiss are absolutely amazing at building tunnels. At one point I began to feel as if we had spent more time underground than above. The tunnels are toll-free (that’s what our vignette helps pay for), smooth, and sometimes incredibly long. 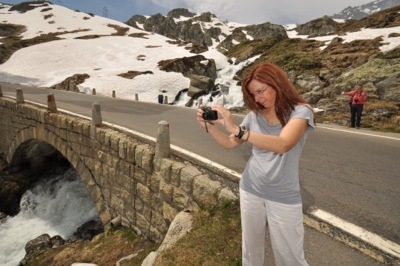 Since we skipped the Gotthard Tunnel the longest one we traveled in was nine kilometers. 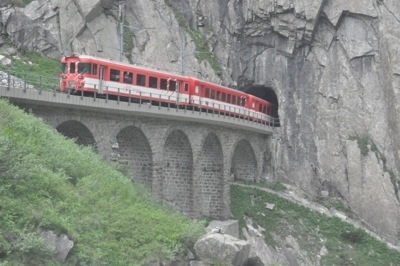 We’ll probably take Gotthard Tunnel on the way back, for 14 kilometers under the mountains. The Furkapass was our favorite section of road. At points it is a highway with a 100 kph speed limit, and then it drops into a village for 50 kph, and then later it narrows into a 1.5 lane road that winds like a snake up into the elevations. It’s definitely not for the timid driver or someone who has a fear of heights, but we loved it and the photo opportunities were spectacular. The snow is melting rapidly in June, and so incredible long cascades of water can be seen tumbling down the steep sides of the mountains. It should be obvious, but in case it isn’t: Definitely don’t come this way with a trailer. We ran into a bit of a delay along the road to the Simplonpass, and a detour that sent us up a lonely road far into the mountains, which was … exciting … Because of road construction I had plenty of opportunities to check wireless coverage in out-of-the-way spots and I was consistently amazed to find 4 or 5 bars of coverage everywhere. That has helped answer a key question about my ability to work from Europe if we come back with an Airstream someday. Road construction has been the one constant in every country on this trip. Tis the season, I guess. I’ve been to Europe many times, driving in England, Wales, France, Germany, Switzerland, and Italy, but never in the summer. Only on this June trip have I encountered so much construction. Building an expectation of road delays into the trip plan would have been a good idea. Still, the scenery was so great everywhere that we didn’t mind. Every village begs for exploration, every corner reveals yet another astonishing vista, every tunnel and cliff-hanging section of road is cause for amazement at Swiss engineering. Both Eleanor and I brought big 16gb memory cards for our cameras so we wouldn’t run out of storage space. My card will hold 2,100 photos, of which I think I used 80 or so just on this section of the drive. After driving across the Italian border (with a cheery wave to the agent who was sitting in his office), we descended for the last time to yet another picturesque valley and then down to Lake Maggiore, one of the beautiful vacation spots of northern Italy. Of all the European countries, I think I am most comfortable in Italy. Perhaps it’s because we’ve spent a fair amount of time here in the past, but I think it’s really just that I like the easygoing feel of the country. If I have business to do, Germany is a great place. It’s clean, organized, modern, and efficient. But for chilling, Italy is my choice. We’ve spent weeks touring here and always have a great time. … which is what I’m going out to do today. Our hotel is near the lakefront, and the ferry dock is a short walk. We’re going to just browse in town for a while and then ride the ferry aimlessly to other towns around the lake. It will be 81 degrees today (finally a little cooler than it has been) and humid, so the ferry should be a nice way to spend the afternoon. We’re packing a picnic lunch again and we shall see what we shall see.